"LARGE 3.25 ACRE OCEAN VIEW"
Amazing Panoramic Views of the ocean, whitewater, and mountains! 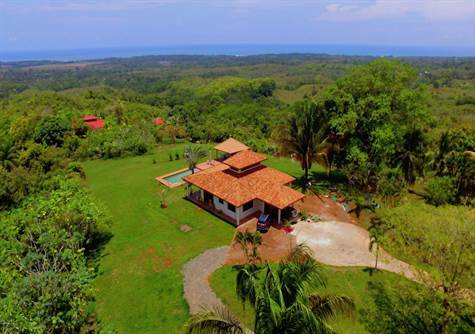 2 Houses and Pool on 3.25 acre Ocean View Property, includes additional ocean view building site. If you are looking for a property with amazing views and lots of usable space this is it! The views are expansive, and the 3+ acres is gently sloping and almost completely usable space, with an additional ocean view building site. This is an exceptional property! The main house was just remodeled with new kitchen, new bathrooms, newly painted, new outdoor gazebo, new on demand hot water heater, and lots of other maintenance and upgrades.The Main House has 2 bedrooms, 2.5 baths, loft/bonus room with hardwood floors and spiral staircase. The house has a wrap around patio, rare almond wood windows, almond hardwood beams, and almond wood kitchen cabinets and countertop. Bathrooms are newly remodeled with new tile, new rainfall showers, vessel sinks, hardwood cabinets and counters, and new eco­-friendly water saver toilets.